St Agatha is one of the best-loved saints and martyrs in Christian devotion. After she refused the advances of a suitor, she died for her virginity. Agatha is one of seven female saints, along with Our Lady, who are mentioned in the the Roman Canon (Eucharistic Prayer 1). This indicates that quite early on historically she had a place of honour in the Roman Church. She is also depicted in the 6th century mosaics of Sant’Apollinare Nuovo in Ravenna. The image here is a detail from a painting by Francisco de Zurbarán (c. 1630) at the Musée Fabre, Montpellier, France. Patrick Duffy writes her story. St Agatha is one of the best-loved saints in Christian devotion despite the fact that very little is known of her life. Both Palermo and Catania in Sicily claim to have been her birth place. She stands for a long tradition in Christian devotion of female virginity, not as an imposition, but as a self-empowering act against a dominant culture. In the sixth century the Christian poet and bishop of Poitiers, St Venantius Fortunatus (535-605), mentions her in his poem on virginity as one of the celebrated Christian virgins and martyrs. There are many versions of the legend of her martyrdom. One is that she was a girl of noble birth, who was sought after by a man of consular rank, named Quintian. He pursued her and when she refused him he had her handed over to a brothel-keeper named Aphrodisia, who tried to corrupt her, but without success. After undergoing various tortures, she is said to have had a vision of St Peter, who strengthened her. But eventually she died from her sufferings. She is said to have had her breasts cut off and is often represented in art carrying them on a dish (as in the image above). This last circumstance has led to her being acclaimed as the patron saint of bell-founders and to the custom in some places of blessing small loaves of bread in church on her feast. She is invoked against fire, especially the eruptions of Mount Etna. Her intercession as patron of Malta is credited with preserving the island from the Turks in 1551. 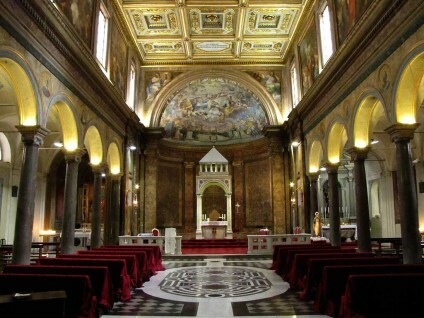 About the year 460 the influential Gothic soldier Ricimer built a church for the Goths in the Suburra area of central Rome (Via Mazzarino today) and we learn from Pope Gelasius it was called the Basilica of St Agatha. As the Goths were Arians, the building was reconsecrated as Catholic by Pope Gregory the Great (590-604). It was restored in the 16th and 17th century and the façade rebuilt by Francesco Ferrari in 1729. The relief above the door shows St. Agatha holding her severed breast on a plate. From 1836 to 1926, it housed the Irish College. Sant’Agata dei Goti is also the name of a comune (town) near Naples.